In my last post I wrote about identifying the hidden gems within your company and how to leverage them as subject matter experts. Of course not everyone is prepared to speak to the media, publish a paper or serve as a keynote speaker. How do you get your SMEs ready for prime time? Media Trainer: This person will prep the expert on how to confidently interview for print, television, radio and social. They also should provide guidance on developing message points, how to control the interview and how to avoid journalist tricks. Publicist: A publicist helps make the client more visible within her market and increases her value. Speaking coach: This person helps the client speak with clarity and confidence. The first time I was asked to give a major presentation, I was fortunate that my company paid for a speaking coach. It really helped me with my delivery and breathing, but not everyone thinks they are worthwhile. Brand Strategists help you develop a strategy to effectively market to your ideal audience. Graphic designers can help design flyers and business cards. Copywriters package ideas into powerful messages. They can help you write your bio so it stands out, for example. Some of these individuals may already be on your team or you may have the skills and can offer the services to your SMEs. If you don’t have individuals within your company that can help, then considering hiring out because you want your experts to stand out – after all, they are representing your company. 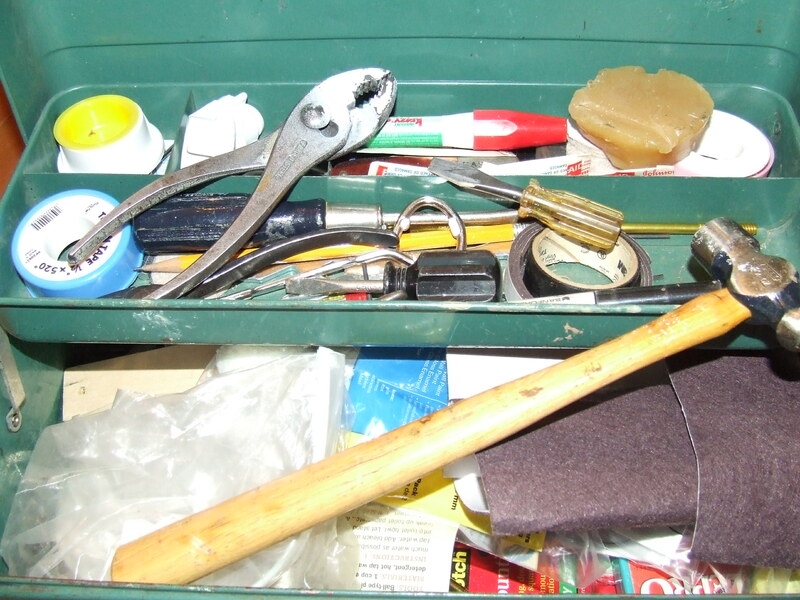 As you help prepare your experts, don’t forget to help them build a brand tool kit. The kit should include the person’s bio and photo, as well as a list of previous conferences and publications. By the way, this advice also holds true for you to develop your own profile. Smith says PR practitioners suffer from the cobbler syndrome because they are always building everyone else’s brand and not their own. So when you finish elevating your SMEs, make some time to build your brand. “You have mastered something if you go to work every day,” says Jennifer Ransaw Smith, founder and CEO of Brand id |Strategic Parnters of Columbia, Md. That means you, or your colleagues, are experts in their fields. If you are tasked with building visibility for your organization you will want to leverage your colleagues’ skills and experience by turning them into SMEs, or subject matter experts. “So many companies aren’t utilizing them to help elevate the entire company in the marketplace,” says Smith. If you work for a large company, consider developing a year-long plan around your SMEs, whom Smith says are the MVPs of the company. The plan should include industry specific conferences and publications. Smith also recommends color-coding the plan with each SME assigned a particular color. The goal would be to have experts speaking at conferences and publishing throughout the year. How can you use SMEs? Have them write for your company blog about their area of expertise. It’s a great way for your followers to better understand your organization’s work. It also makes colleagues proud of the work that is done. Identify industry publications and ask them to submit articles. Then promote the publications on your website and with your stakeholders. Ask them to speak at conferences, workshops and trade shows sharing their expertise. Last year the National Federation of Press Women held its annual conference in Salt Lake City, Utah. They invited a few speakers, but most of the talent came from within the membership. Members spoke about publishing, freelancing, social media trends, photojournalism, branding and Freedom of Information. Hold Lunch and Learns within your company. Use your internal talent to offer training on everything from tax tips (auditors) to project management to industry successes. Have them speak on your behalf. Reporters always need reliable industry leaders to quote in their stories. Offer your experts to them. I’ve heard a few people talk about how frustrated they are by their jobs and some are even bored, even though they are super busy. That sounds to me as if they are not learning and growing. In fact, one person confided in me and I suggested he might want to learn a new skill or, at least, volunteer for a committee that put him outside his comfort zone. Fortunately, he works somewhere where that is a possibility. Take a class. Community colleges and universities have short courses geared to specific topics. Or try a one-day seminar through a museum or botanical garden. I took a course on online publishing through a museum, and applied some of what I learned to my job. I also am still planning to publish an e-book, and it will be much easier now because of what I learned. Study online. One of my favorite ways to learn about software, business and creative skills is through Lynda.com, which allows you to “learn what you want, when you want.” The site also provides exercise files to practice what you are learning. Last week I took a course in PowerPoint that was hugely helpful. I only wish I had taken it years ago. Read a book. I love to read fiction, but I also try to read several books about leadership and management to hone my skills. I even participate in a book club at work where we discuss such books. Even if I haven’t read the book, I learn from the discussion. Join a group. If you are interested in something, learn from others. I belong to several professional groups. Members are an invaluable resource for me. Attend a conference. A highlight each year for me is attending the NFPW conference, which moves around the country. I attend as many workshops as possible and come away with a wealth of ideas. Last year after leaving the conference, I revised my resume based on what I had learned. I also applied creative techniques to my writing. How will you continue to grow and learn? Part of my job as director of communications for a global organization is understanding global trends and their impact on the work my organization does. Earlier this month, I listened to a live telecast focused on the communications aspects that surrounded the World Economic Forum, recently held in Davos, Switzerland. What struck me about the conversation that featured Arianna Huffington, Adrian Monck and Olivier Fleurot is how much the communications landscape has changed in less than a decade. Monck, who is managing director of Communications and Media for the World Economic Forum, noted that communicators now have access to incredible tools. For example, Twitter is one of the primary ways to stay informed. “There are these engines for creating a platform to talk about serious stuff,” he said. Monck, who is responsible for disseminating communications from the World Economic Forum, said he is no longer reliant on the media to report the conversations. “The old method was to ‘PR’ it, but now you have platforms to have your own conversations,” he said, referring to social sites and blogging. He wasn’t criticizing public relations, but rather noting how using all of the platforms can lead to a “phenomenal release” of information. I considered his comments in the context of conferences I attend. At social media ones, the Twitter feed is usually scrolling on a screen within the room. The comments often add to the conversation. For example, the speaker may not recall the exact title of a book. While he continues to speak, an audience member quickly identifies the book and shares it via Twitter. Everyone in the audience now has it. For change to happen, Huffington said, a critical mass is needed to make a difference, and social media can help with that. She also talked about how huge problems can be solved through philanthropy and the rise in the number of companies that are making causes part of their annual plans. I’ve seen many more job postings that relate to corporate social responsibility. It’s an opportunity often to combine philanthropy and communications in one position. A recent snow day provided me an opportunity to slow down. One of the things I did was write a letter. Yes, I wrote a letter. I used a pen and put my thoughts down on paper. I then folded the letter, placed it an envelope, addressed it and put a stamp on it to mail it. It’s something my mum and I have done since my freshman year of college. We started writing letters to keep in touch, and in many respects, I prefer her letters to a phone call. For one thing, I can read the letter any time, and I can go back and reread it. Our letters aren’t about big life events – at least, not often. They are about the mundane things of life that make a life worth living such as pinochle scores, what was for dinner or how often the dog went for a walk. I doubt we would ever share those moments in a phone call. I realized that with Valentine’s Day tomorrow, I have lots that I love when it comes to communicating, both in an old-fashioned manner and in the digital age. Fountain pens (and good pens in general) A mentor hooked me on them, and now I have a nice collection, including a Mont Blanc. 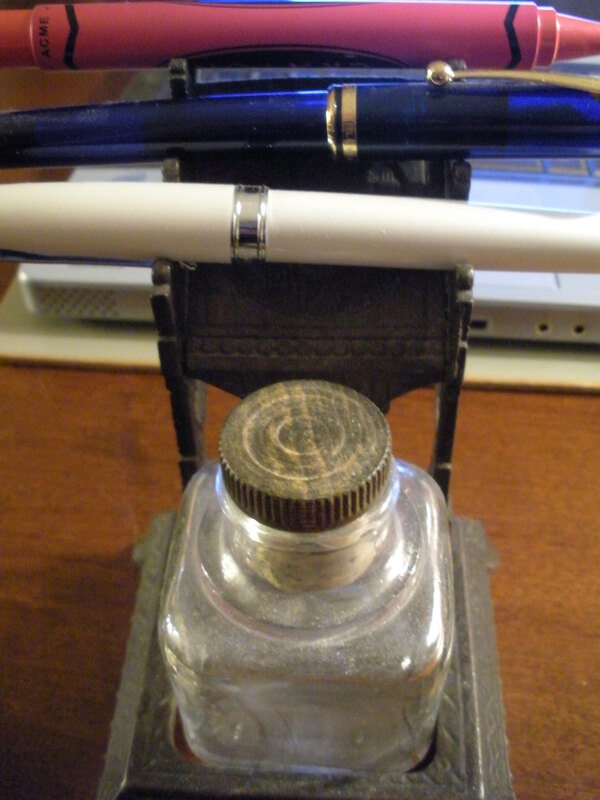 Each pen has a specific ink that I like to use. Note cards It’s a terrible habit, but whenever I travel, I pick up note cards. I like to drop my friends short notes or to thank a colleague for going the extra mile. Small note books These are another indulgence. One of my friends frequently buys me notebooks. One time she was worried because I had just decreed that I didn’t need any more. Of course, that was before I saw the trio she had purchased for me – each with a scene of London. They are perfect for taking notes at an impromptu meeting, making lists for the weekend or just doodling. Facebook Without I would lose track of many friends. While I really enjoy writing letters, not many people do and when you don’t get any feedback, it’s hard to keep the conversation going. On Facebook, I can check in on friends, update them on my life and keep the conversation going. Smartphone I never thought I would be one of those people who would feel lost without their phone, but I am. However, I’m not worried about phone calls. I do want the camera, the GPS, my apps, text messaging and all the things that enable me to communicate easily. What is your favorite communications tool? How do you make yourself stand out from the crowd? 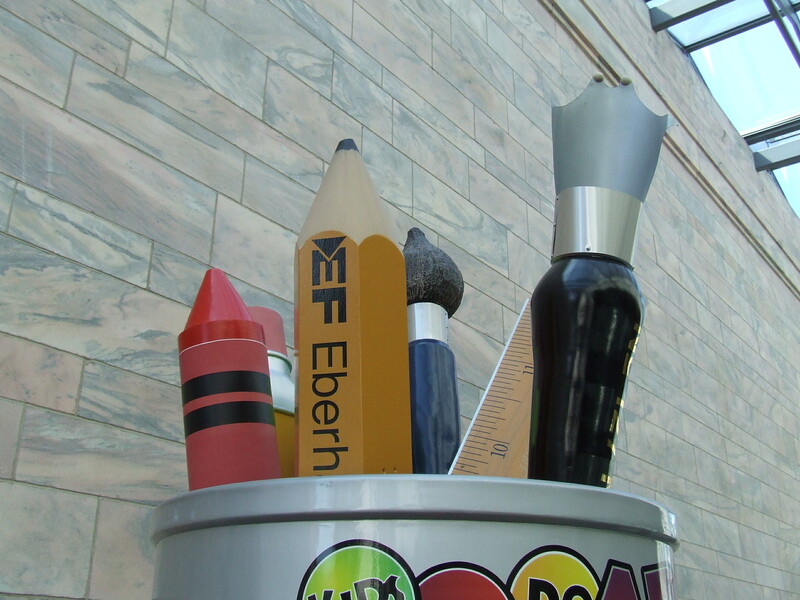 The key is to have your own personal tool kit or brand identity. It’s a way to create personal elevation for yourself, says Jennifer Ransaw Smith, CEO and Chief Brand Strategist of Brand ID.What should your tool kit include? Bio: Almost everyone has a bio that they can submit, but do you have both a long one and a short one? This is critical because a longer one may be needed to introduce you, but a shorter one will be used in marketing materials. You don’t want to leave your bio – think reputation – in the hands of someone who doesn’t know you. Be sure you have both written. The short one should be about 75 words. I recommend having a colleague review it because I’ve always found the short one the most challenging to write and invariably I leave out the one thing that my colleagues say should be included because it’s the differentiator. Professional Headshot: It’s worth the money to get someone to take your photo. And you can write it off as a business expense. Then use the photo on your LinkedIn profile or anytime someone requests one of you. Speaker’s Sheet: If you do any public speaking, keep a list of the organizations to which you have spoken. If you give a major presentation to the office include that on your list. If yours is a short list you may have it included on your resume, but when you are trying to secure additional speaking roles, organizers want to only see the list and not everything else on a resume. Include the organization, title of speech and location. If you have it, also note the audience size. If you are looking to gain speaking experience, start with local professional associations, including business and civic groups. They often are seeking expert advice on topics and would be delighted to have you speak. While there is no speaker’s fee or honorarium, you will gain invaluable speaking experience for your portfolio and the group learns from your expertise. Speaker’s Reel, Media Reel, Thought Leadership Reel: Have you been quoted by the media? Have your speaking engagements been captured on video and shared on a website or through YouTube? Create a sheet that includes links to media quoting or interviewing you. Create a video clip that demonstrates your speaking prowess. It’s no longer enough to say that you are an expert on a particular topic, you must demonstrate it. TED Talks, for example, require nominees to submit a short video to demonstrate their speaking style. Because of my role as a spokesperson, I’ve been quoted in publications and been interviewed by the media more times than I can count. It’s part of my job and I don’t think twice about it. Nor have I kept track of the interviews. Then one day I was asked for examples. Fortunately, Google made it possible to find some of them, and I’ve now started a list with links. Client Testimonials: When you speak somewhere and receive positive comments, ask the person if they would provide you with a written testimonial that you can use going forward. I used to do a lot of media training, and I always asked participants for feedback and permission to use their comments. It’s helpful to have several of these to share if asked by someone who is considering you as a speaker. I have a bad habit when I’m at networking functions of constantly scanning the room even when I’m speaking with someone. It comes from my days of reporting – always looking for the next story and being aware of my surroundings. To the person with whom I am speaking, though, it’s rude. Through the years, I’ve become much better about staying engaged in the conversation I’m having with a person, and that means keeping my eyes focused on the person and not my surroundings. At my desk, if I’m talking on the phone, I turn away from my computer because it’s all too easy to glance at emails and even reply to some. The person on the other end of the phone may not see me sending an email, but he will know that I am distracted. Asking questions. It’s a reporter’s trick and an easy way to learn more about the person. If I’m asking the questions, I’m going to listen to the answers. I try not to ask yes or no questions but rather open-ended ones so the person can elaborate. Not interrupting. Again, as a reporter, we’re taught to shout out questions at press conferences, but when speaking with a person I need to allow her to finish her thoughts before I ask my question or respond to what she is saying. I often wait a second or two before saying anything to ensure my colleague has finished speaking. Actively listening. I want whomever I am speaking with to know that I am interested in what he has to say so I nod at appropriate places and make eye contact. I’ll even repeat back what I think I heard so my colleague can clarify if I misunderstood. These simple steps can go a long way in ensuring successful conversations.